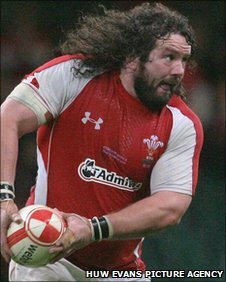 Prop Adam Jones has been added to the Wales squad for the Six Nations finale away to France next Saturday. The British & Irish Lions tight-head made his Ospreys comeback in the win over Glasgow on 5 March after being out for seven weeks with an elbow injury. Jones replaces Ospreys team-mate Craig Mitchell, who dislocated his shoulder in Saturday's 19-13 win over Ireland. Scarlets wing George North has also been added officially to the squad and is in contention for the trip to Paris. Wales coach Warren Gatland will name his match 22 to face France at 1300 GMT on Thursday after twice postponing it from an original Tuesday announcement. Mitchell left the field in obvious pain after 11 minutes and was replaced on the pitch at the Millennium Stadium by John Yapp, with Paul James shifting across from loose-head to tight-head. "Craig has now had corrective surgery after dislocating his right shoulder," said the Wales national performance medical manager, Prav Mathema. "The operation went very well and we would now expect him to be back playing within a 12-16 week period." Wales had opted not to call up Jones for Saturday's clash with Ireland, with Gatland saying the 30-year-old tight-head might have gained too much weight during his absence. "He knows if he turns up on Tuesday and he's overweight then I'll turn around and send him home," added Gatland. "So hopefully he might be in the sauna [on Sunday]." Mitchell, 24, has proved himself to be more than an able deputy for Jones in the Wales front row, having started all four games in the campaign so far. But his game came to an abrupt end against Ireland after injuring his right shoulder while tackling opposite prop Cian Healy. "It's unfortunate for him, particularly so early in the game. He's had a great campaign and given that depth we were looking for as cover for Adam Jones," explained Gatland. "His work-rate has been outstanding and I don't think he's had the credit he deserves for how hard he's worked around the field." Forwards: Paul James (Ospreys), John Yapp (Blues), Adam Jones (Ospreys), Ryan Bevington (Ospreys), Scott Andrews (Blues), Matthew Rees (Scarlets, capt), Richard Hibbard (Ospreys), Huw Bennett (Ospreys), Alun Wyn Jones (Ospreys), Bradley Davies (Blues), Ryan Jones (Ospreys), Sam Warburton (Blues), Jonathan Thomas (Ospreys), Andy Powell (Wasps), Josh Turnbull (Scarlets), Rob McCusker (Scarlets), Dan Lydiate (Dragons). Backs: Mike Phillips (Ospreys), Dwayne Peel (Sale), Tavis Knoyle (Scarlets), Stephen Jones (Scarlets), Rhys Priestland (Scarlets), James Hook (Ospreys), Jamie Roberts (Blues), Jonathan Davies (Scarlets), Shane Williams (Ospreys), George North (Scarlets), Morgan Stoddart (Scarlets), Lee Byrne (Ospreys), Leigh Halfpenny (Blues).